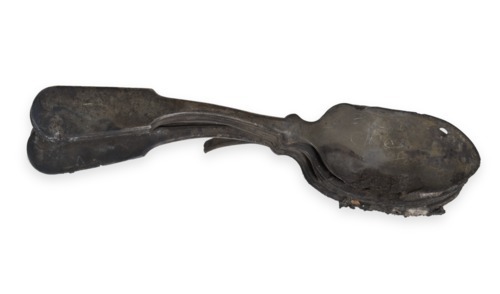 Eleven steel serving spoons melted together during the Great Chicago Fire of 1871. A massive fire destroyed four square miles of downtown Chicago on October 8-10, 1871, killing hundreds of people. The intense heat was known to melt low-grade metals. These spoons display signs of fire exposure, including surface discoloration and stone fragments imbedded in the melted metal.